Choosing Ping under a core name issues a ping request to check whether the core is up and responding to requests. The search executed by a Ping is configured with the Request Parameters API. See Implicit RequestHandlers for the paramset to use for the /admin/ping endpoint. 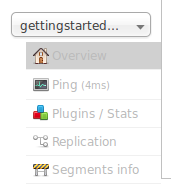 The Ping option doesn’t open a page, but the status of the request can be seen on the core overview page shown when clicking on a collection name. The length of time the request has taken is displayed next to the Ping option, in milliseconds. This command will ping the core name for a response. Both API calls have the same output. A status=OK indicates that the nodes are responding.